﻿ Golden Silk Boutique Hotel, Hanoi | FROM $52 - SAVE ON AGODA! "All employees are so professional I am so happy ." 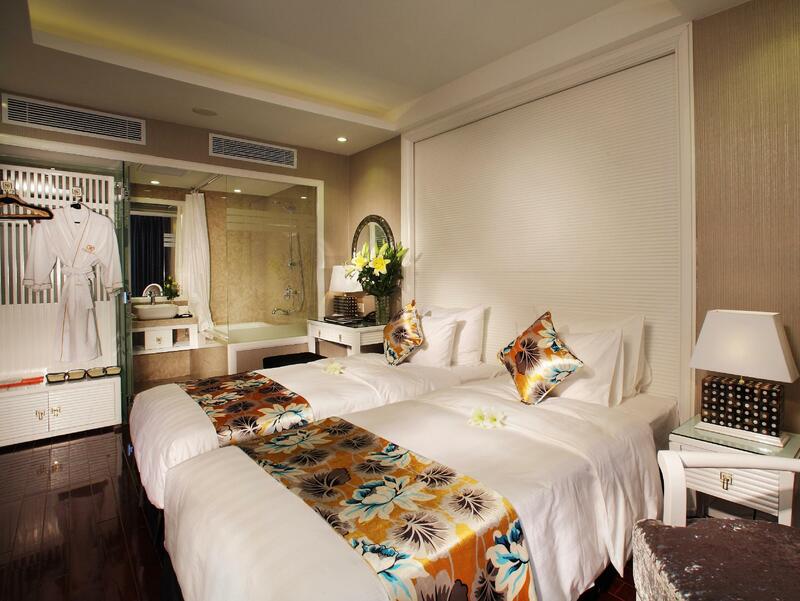 Have a question for Golden Silk Boutique Hotel? "The staff was very helpful and breakfast was delicious." "Front desk people give me very wonderful service." "Good location & clean room"
"Great management and services staffs." 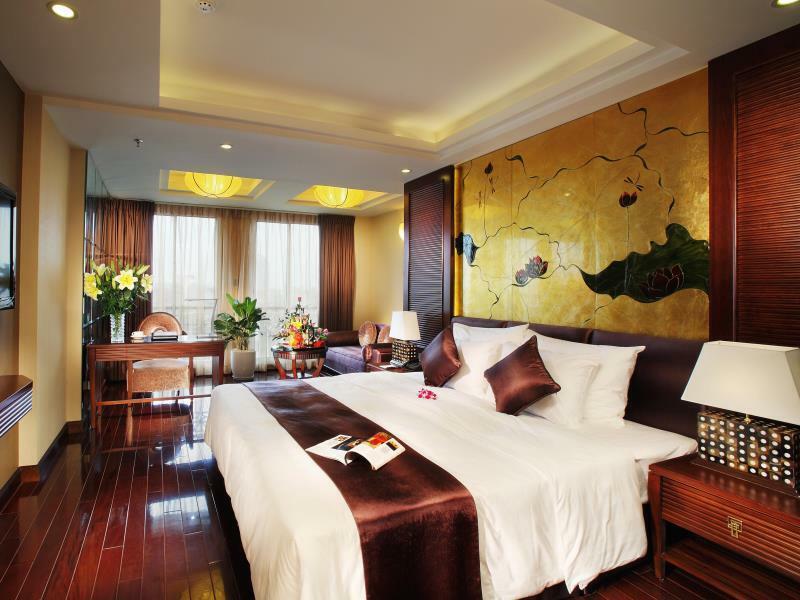 With exceptional location ratings, the Golden Silk Boutique Hotel allows you to easily enjoy all that Hanoi and its surroundings have to offer. Rated 4 stars, the hotel provides you with everything you need for a fantastic getaway. 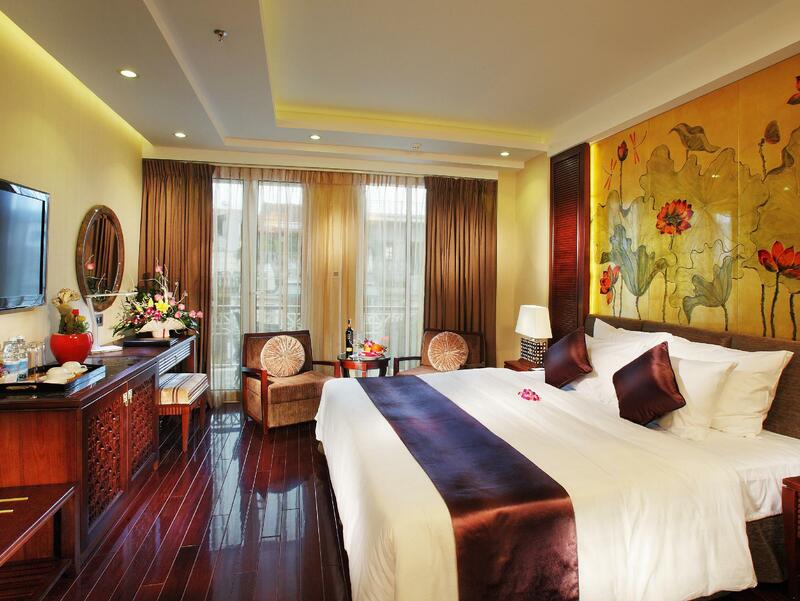 The rooms here overlook the city for beautiful views of Hanoi. 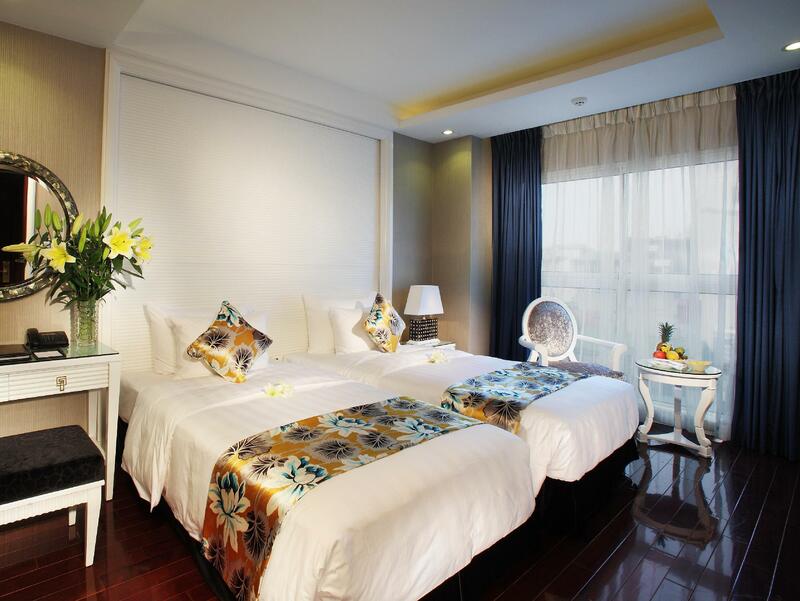 This hotel is near places of interest such as Yen Boutique-Hanoi Tailor Made Clothes, Curve-24 Hour Tailoring, Vanloi Oriental Style, Tagilis, and Dinh Co Vu. 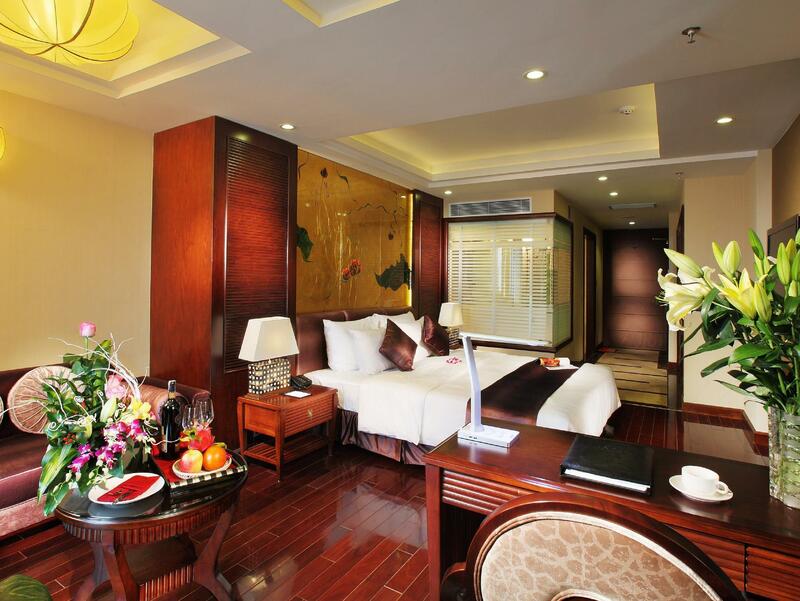 Offering guided tours, the Golden Silk Boutique Hotel is a great spot to stay to learn about the area. There are massage facilities in this area, so if you want to spend your day relaxing and unwinding, you can easily do so. The Golden Silk Boutique Hotel has a variety of facilities for you to make use of throughout your stay, such as a hot tub, a spa, and a sauna. The hotel features family rooms, so your family is provided ample space to be together. It features a bar, a coffee shop, restaurants on the property, a shared kitchen, and room service, so there is a range of dining and snacking choices. With safety deposit boxes, a fireplace, a salon, a convenience store, as well as a selection of shops, it offers various convenient features to make your stay more comfortable. There's free Wi-Fi available in all rooms, as well as Wi-Fi in common areas, ensuring that visitors are able to connect with their friends and family without splashing out on international charges. The Golden Silk Boutique Hotel offers a range of convenient services, such as dry cleaning services, a concierge, and a babysitting service. All of the rooms come with air conditioning, free bottled water, a refrigerator, and a hair dryer, as well as satellite or cable channels, bathrobes, an in-room safe box, a shower, and other amenities. Enjoy a delicious breakfast for free when you get up in the morning, and start your day on the right foot. The front desk is open around the clock, so there will always be a member of staff behind the desk to assist with any questions that you have. With pet-friendly facilities, the Golden Silk Boutique Hotel is ideal for travelers who wish to take their pet on holiday with them. The Golden Silk Boutique Hotel gives you access to numerous transport options, such as airport transfers, car rentals, bicycle rentals, shuttle services, and taxi services, getting you that much closer to all there is to do in the area. Hanoi Railway Station is 1.1 km away. The nearest airports are Gia Lam Airport (VGL) and Noi Bai International Airport (HAN), which are located 4 km and 21.2 km away. Check-in is offered from 02:00 PM and check-out is until 12:00 AM. "Overall is nice, especially hotel location." I enjoyed my stay at this hotel. The location is very good and the Staff especially were excellent. Especially TRACY AND VU THUY LY. They were very kind to me and my GF. They will help in any way you wish. Their exchange rate to the Usd is better at this hotel than any money changer in town. Breakfast is very nice. Good cleanliness, comfy room, good services and hospitality. Nice breakfast and consumptives. 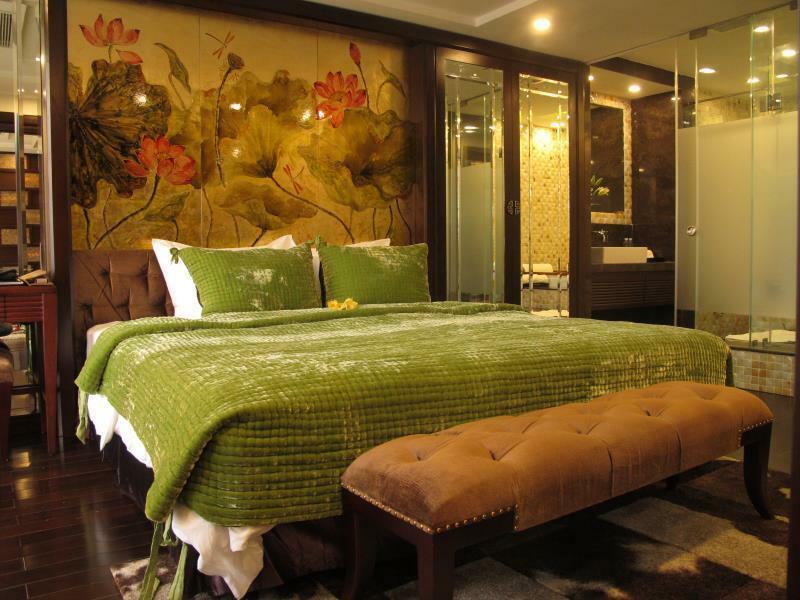 Wonderful located at the heart of Old Quarter zone and close to Hoan Kiem Lake. Many shops, restaurants, cafe and bar surrounded. Worth for your pennies. Recommend. Stayed at junior suite level 8. Corridor area quite dim. Per level around 5 or 6 rooms maximum. Room is big and comfortable big King bed (even for twin beds which my friends stayed along, also comfortable). However, the bathroom filled with water from the standing shower area. Have to use all available towels to lay on the floor to prevent slipping. Food and shopping is easily available. Overall a nice hotel to stay as staff are also vey polite and speaks English. Great room- comfortable bed and very spacious for anywhere let alone Hanoi. Love that the decor is true to the Vietnamese heritage. Location is excellent as it is close to the old quarter and Lake. Breakfast was OK, nothing to rave about, the quality could be a lot better. Staff were great, very friendly. the presidential suite balcony is very dirty... there is no table outside to sit and relax. the jacuzzi inside presidential suite is perfect. what i find uncomfortable is the manager during breakfast to be served by her staff, i know it is her privilege to have breakfast but i find it not pleasant to the eyes seeing all your staff serving you like a queen and all other quests go to the buffet table to get food. or she can do self serve, the buffet table is easy to access. nothing against her anyway... the good thing about this hotel are their staff, very friendly and accomodating, even during check out, a staff gave us tea- well done!!! The staff was very helpful and breakfast was delicious. The location was near for the old Town in Hanoi. So nice and kind staffs! Overall is nice, especially hotel location. Room also neat and well maintained. Only thing i feel trouble is shower which is weak and difficult to control hot/cold. Acceptable choice. I really enjoyed my time here. The breakfast was very nice and the staff VERY helpful. One thing tho: I read that we must meet our guests in the lobby so I went to collect my friend. We came to my room while I got ready to go to dinner when the front desk rang stating that he had to give them his id in order to visit me in the hotel! What hell and invasion of privacy is this?! We complied without issue but when we left they were badgering him about the photo on his id. Truly NONE of their business to be harassing my friend who was so kind and helpful to me. I'm moving to Hanoi and without his help I would have been lost. I would never go back here because of that privacy issue. I was so embarrassed that they were so intrusive to my life and to his personal business. Really shame on you. I changed hotels and didn't have that problem anywhere else. Very good hotel, but there are cheaper options. The location is excellent and that alone can justify the cost. I would stay here again without question as I know what I am getting, but there are so many options in the city you might find some cheaper ones if you look. With that said, this is a very consistent and solid choice for people who like to just set it and forget it. 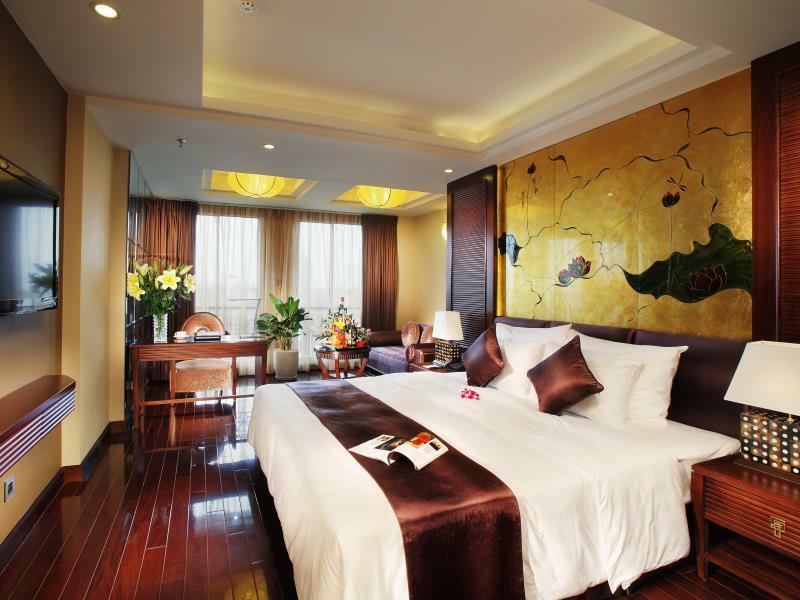 Golden Silk Hotel, centrally situated in 'Silk Street', is a highlight among Hanoi's many boutique hotels. Converted from two houses, the hotel comprises an ornate, narrow building, and is well restored and crammed with charming features. A highlight is the lobby bar,a place of rococo splendour that also makes a great martini. There is also a roof top bar. There are a variety of rooms for all traveller needs, so you need to be very careful in your order about the class of your rooms and the size and space you desire as there is room for confusion. The location is the clincher: nowhere this central to the touristic buzz is this splendid. We have stayed there twice and have not been disappointed. Nice rooms, friendly helpful staff, great breakfast and in a central location. For the price I wouldn't stay anywhere else. My only piece of advice would be to ask for a street view room on a higher floor. We enjoyed a nice stay at the Golden Silk. The location was wonderful, as it is close to so many points of interest as well as delicious restaurants and shopping. The breakfast buffet was fantastic. Lots of items were made-to-order and/or very fresh. Would recommend the omelet, the pho, and the bun thang. The shower / bath was a bit awkward as it was raised up, and a lot of water would end up on the floor. Also, bring a night light, as the rooms do not have windows and are quite dark when the lights are off. location is nice, walking distance from attractions. Spa was very nice. Coordination of staff is an issue. Our previous hotel transferred our luggage to this hotel but staff doesn't knew it because the person who collect was different and he never informed front desk. We have to goto previous hotel to ask for luggage , they call this hotel had still could not trace it for 15 mins. Our rooms were upgraded to the next category for our first night before going to Halong Bay. Rooms are reasonable size and is clean. The staff at reception are very nice and can speak English well. The location is near to Silk street which is rather convenience to walk around the old quarter area. It was better than expectation. Some suggestions for improvement, would include more cerals at breakfast like porridge or bircher. The bed was very firm, option for softer bed would have made our staff perfect. We actually checked in quite early but the staffs quickly prepared the room for us. While waiting, one of the staff explains about the surrounding and how to go around in a considerably fluent english. Following his guidance, we spent the day going around by foot. By the end of the day we have visited St James Cathedral, Hoan Kim lake, Fanny ice cream, Hanoi Prison, Opera House & the Night Market!! Since we only have 2 days, we decided to go to the Halong Bai the next day. The tour recommended by the hotel is reasonably price and we found out that it is one of the best in service. The room is nice, but it will be nicer if we can get a room with a real window. Maybe next time we will ask for one but don't really mind if cannot get any considering most hotels in the Old Quarter had the same problem.